Syrnia does not provide you with a map overview of Arch Caves 2. To be able to move around here you will need to find the locations on your mini map without any reference. Arch. 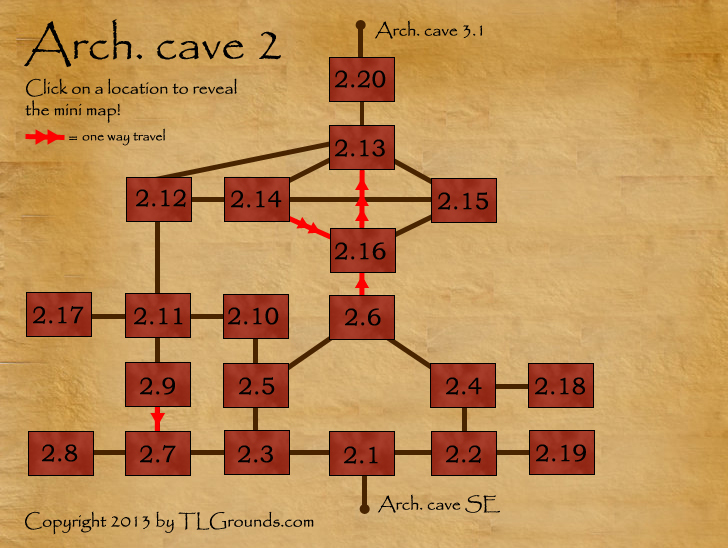 cave 2 can be entered from Arch cave SE (you arrive at Arch cave 2.1). You can move down the Arch cave system from Arch cave 2.20 (to Arch. cave 3.1). To make things easier we have created a movement tool for Arch. caves 2 which shows where you have to click on the mini map! Click on a location in the map below for more information about that location, e.g. cityoptions and creatures. None of the locations on this map have citymenu options. The following creatures live on this map. They can be fought in single/mixed combat training, as autoattack and/or as groupfighting spawn.